Scott’s latest plays like an old-fashioned Hollywood epic—big stars, gorgeous sets and costumes, sweeping storyline, enormous set pieces, and so on—served up with state-of-the-art digital effects and a contemporary, revisionist interpretation of the Old Testament. It’s certainly a much more of a two-fisted look at the Bible’s most famous tale—God (here depicted as a petulant child) wants those Egyptian oppressors to suffer, while Egyptian general turned Hebrew savior Moses is reluctant to embrace his destiny as the conduit of God’s wrath. The most “miraculous” aspects of the story—God’s plagues upon Egypt and the parting of the Red Sea—are presented here in a “realistic” context. So, the pestilence, vermin, frogs, boils, etc. are seen as possible natural occurrences that really could have went down, while the Red Sea’s parting and subsequent vanquishing of the Egyptian army are cinematically imagined to be the before-and-after results of a tsunami. The pacing and performances in the film aren’t perfect—I liked Joel Edgerton’s (Animal Kingdom) boorish Ramses and John Turturro’s (The Big Lebowski) wizened pharaoh the best—but there’s simply too much to look at and take in to not enjoy the Exodus experiences. As for the digital effects, they’re simply gorgeous—dig those plagues!—though I could have done with a few less sweeping overhead shots of Memphis, the Egyptian desert, the liberated hordes, and the handful of large-scale battle sequences. As for Scott’s “whitewashing” of the cast, oh please….You try making a $140 million biblical epic without big box-office names in the cast…. 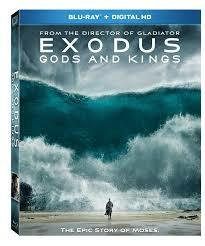 Among the bonus features on the 2D Blu-ray disc (the bonus disc on the 3D edition has much, much more) are an “Exodus Historical Guide,” a pop-of track of historical tidbits that add supplementary info to the story. 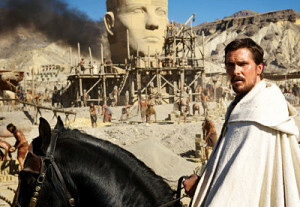 There are also 15 minutes of deleted and extended scenes, the most memorable featuring more of Sigourney Weaver’s (Paul) severely underused Queen Tuya, the mother of Rameses, and a short, nighttime look at the Hebrews’ celebrating of their liberation with a golden calf (bad idea…) while Moses has a pow-wow with God atop Mount Sinai. -“I’m usually right on budget. And form th most part, I’m cohesive and reasonable….more of the time.